진심으로 환영하며 감사의 말씀을 드립니다. 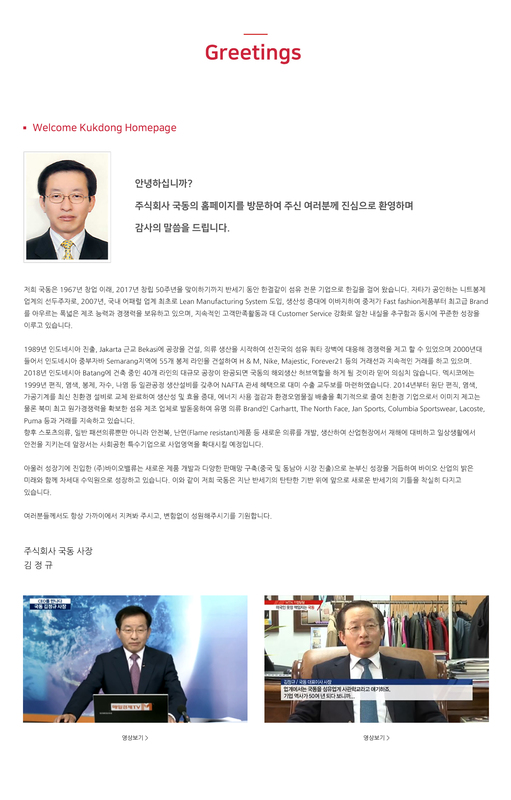 I sincerely welcome and appreciate your visit to the homepage of Kukdong Co., Ltd.
주식회사 국동의 홈페이지를 방문하여 주신데 대해 진심으로 환영하며 감사 드립니다. 저희 국동은 1967년 창업 이래, 2017년 창립 50주년을 맞이하기까지 반세기 동안 한결같이 섬유 전문 기업으로 한길을 걸어 왔습니다. 1989년 인도네시아 진출, Jakarta 근교 Bekasi에 공장을 건설, 의류 생산을 시작하여 선진국의 섬유 쿼타 장벽에 대응해 경쟁력을 제고 할 수 있었으며 멕시코에는 1999년 편직, 염색, 봉제, 자수, 나염 등 일관공정 생산설비를 갖추어 NAFTA 관세 혜택으로 대미 수출 교두보를 마련하였습니다. 2000년대 들어서 인도네시아 중부자바 Semarang지역에 55개 봉제 라인을 건설하여 H & M, Nike, Majestic, Forever21 등의 거래선과 지속적인 거래를 하고 있으며, 자타가 공인하는 니트봉제 업계의 선두주자로, 2007년, 국내 어패럴 업계 최초로 Lean Manufacturing System 도입, 생산성 증대에 이바지하여 중저가 Fast fashion제품부터 최고급 브랜드를 아우르는 폭넓은 제조 능력과 경쟁력을 보유하고 있으며, 지속적인 고객만족활동과 대 Customer Service 강화로 알찬 내실을 추구함과 동시에 꾸준한 성장을 이루고 있습니다. 2014년 부터 멕시코의 원단 편직, 염색, 가공기계를 최신 친환경 설비로 교체 완료하여 생산성 및 효율 증대, 에너지 사용 절감과 환경오염물질 배출을 획기적으로 줄여 친환경 기업으로서 이미지 제고는 물론 북미 최고 원가경쟁력을 확보한 섬유 제조 업체로 발돋움하여 유명 의류 브랜드인 Carhartt 등과 거래를 지속하고 있습니다. 2018년 인도네시아 Batang에 건축 중인 40개 라인의 대규모 공장이 완공되면 국동의 해외생산 허브역할을 하게 될 것이라 믿어 의심치 않습니다. 향후 스포츠의류, 일반 패션의류 뿐만 아니라 안전복, 난연(Flame resistant)제품 등 새로운 의류를 개발, 생산하여 산업현장에서 재해에 대비하고 일상생활에서 안전을 지키는데 앞장서는 사회공헌 특수기업으로 사업영역을 확대시킬 예정입니다. 아울러 성장기에 진입한 (주)바이오밸류는 새로운 제품 개발과 다양한 판매망 구축(중국 및 동남아 시장 진출)으로 눈부신 성장을 거듭하여 바이오 산업의 밝은 미래와 함께 차세대 수익원으로 성장하고 있습니다. 이와 같이 저희 국동은 지난 반세기의 탄탄한 기반 위에 앞으로 새로운 반세기의 기틀을 착실히 다지고 있습니다. 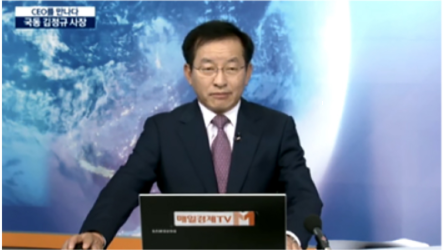 여러분들께서도 항상 가까이에서 지켜봐 주시고, 변함없이 성원해주시기를 기원합니다. Since its founding in 1967, Kukdong has engaged in the original equipment manufacturing (OEM), sale, and export of men's and women's knit clothing and recently celebrated its 50th anniversary in 2017. The company is headquartered in Seoul, South Korea. In 1989, we expanded to Indonesia and built a factory in Bekasi, a suburb of Jakarta, which enabled us to increase our competitiveness in response to textile quota barriers in developed countries. In 1999, Kukdong established a vertical production facility for knitting, dyeing, sewing, embroidery and printing in Mexico and established a bridgehead export to the US with NAFTA tariff benefits. In the 2000s, we built 55 sewing lines in the Semarang area of central Java, Indonesia and have been in continuous business with clients such as H & M, Nike, Majestic, Forever21. 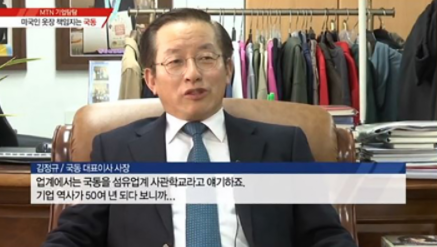 As an acknowledged leader in the knitwear industry in Korea, the company introduced the Lean Manufacturing System for the first time in the domestic apparel industry in 2007. The LMS contributes to increased productivity and manufacturing capabilities; ranging from mid to low priced fast fashion products to high end brands. We are constantly striving for 100% customer satisfaction through strong customer service. Since 2014, Mexico plant has completed the replacement of knitting, dyeing, and finishing machines with the latest eco-friendly techniques, thereby dramatically enhancing productivity and efficiency, and at the same time we have reduced energy use and environmental pollution. As a price-competitive vertical manufacturer, we currently offer private label products for well-known brands such as Carhartt, The North Face, JanSports, Fanatics, Lacoste and Puma, etc. I believe that when the large-scale plant of 40 lines under construction in Batang, Indonesia, is completed in 2018, it will act as the overseas production hub of Kukdong. In the future, Kukdong will continue to develop and produce clothing, not limited to only sports clothing and general fashion apparel, but we will also expand our production to safety apparel and offer flame resistant products. Additionally, Bio Value Co., Ltd., which has entered into the growth phase, is rapidly becoming a next generation profit source with new remarkable R&D product development and various sales network (entry into China and Southeast Asian markets). Bio industry is a promising area with a bright future. As shown, Kukdong is steadily building a new half-century foundation based on solid expertise from the last half century. I hope that you will always keep a keen interest in us and support Kukdong constantly. 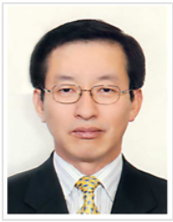 A Vice-President of Kukdong Co., Ltd.